READY TO START TAKING 2019 ORDERS AND SETTING UP DELIVERIES. 2 ft x 5 ft Roll. blend, premium Shade Mix or NEW this year RTF turf type tall fescue blend.. 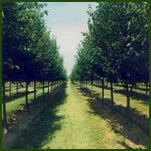 Shade & Ornamental Trees are available from our 25acre nursery. Grown in their native soil. We offer the best in the industry for quality and service. The Nifty Fifty Big Roll allows our customers to improve marketing, installation efficiency and to be competitive with hydro-seeding. Switching to the Big Rolls permits a crew of two or three to install two semi-truck loads (34,200 sq ft) of sod a day at a profit. It takes much less labor to install and cuts overhead for the lawn care specialist. 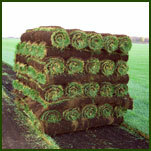 Bluegrass blend (Midnight, Brilliant & Able I) sod, grown on peat soil or on mineral/topsoil. The use of 3 different varieties is beneficial to avoid widespread turf reaction to insects, diseases, heat or cold. The seed blend has been chosen for its dark green color, disease resistance, & tolerance to drought and heavy traffic. It is maintained at 2”mowing height. Also available in a 10 square foot small roll. For use with Nifty 4- Fifty, can purchased or rented. The bracket fits through the core and onto the tractor or forklift which unrolls the sod as it moves. It attaches to the forks of a skid steer or the 3pt hitch of a tractor. 90% of the weight of grass is in its roots. The front lawns of 8 average houses have the same cooling effect as 24 home central air conditioning units. Turf reduces glare, filters odor and noise, and most important, turf absorbs carbon dioxide and traps much of the estimated 12 million tons of dust and dirt released annually into the U.S. atmosphere. A 50 by 50 foot turf grass lawn releases enough oxygen for a family of four; the grass and trees along the U.S. interstate highway system release enough oxygen to support 22 million people. Sod provides instant beauty and instant value. 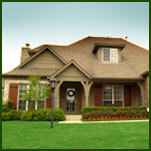 Research shows that landscaping with sod instantly increases the market value of your property from 5% to 10%.